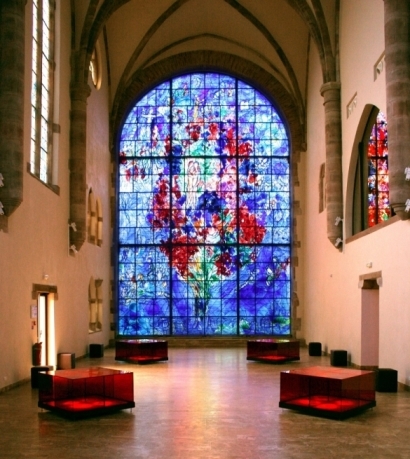 The Peace Window is the largest stained-glass window made by Chagall. It is 12 x 7.5 m and covers the whole west facade of the Chapel of the Cordeliers in Sarrebourg, a small town in the Vosges Mountains in France. 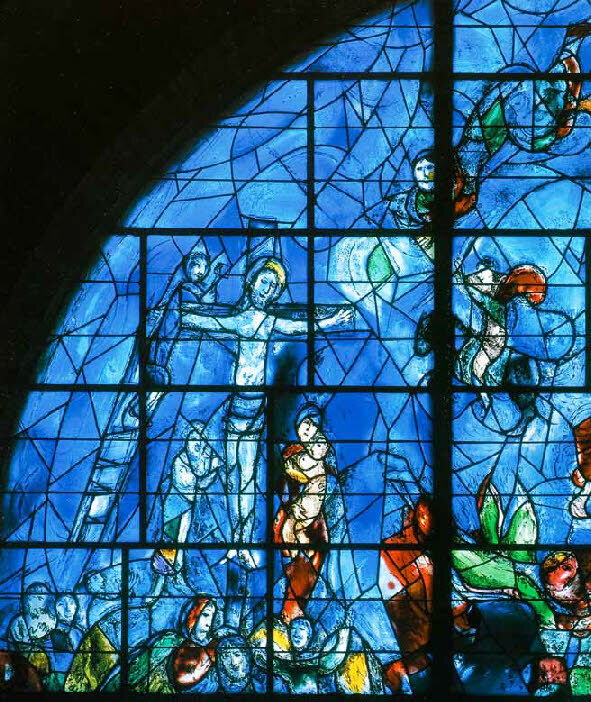 Most striking about this window is that three times Chagall depicts Christ in it. Does Jesus play a central role in peace according to Chagall? Entering the chapel the visitor is overwhelmed by a spectacle of vivid colours that fill the whole space with their glow. A bright blue is the main colour, the blue of the sky, of heaven. The heart, the centre of the window, resembles a colourful bouquet of flowers: green, orange and red. Perhaps it portrays the tree of life that we know from paradise. The bouquet can also refer to the stump of Jesse out of which grows the Messianic realm of peace. In the middle of the bouquet a man and a woman form an intimite unity bound by love – man and woman created in God’s image. To the right of the tree of life the vision of the prophet Isaiah has been rendered. We see the wolf together with the lamb, the calf with the lion and a little child who leads them (Isaiah 11:6-9). In the window Jesus is depicted not just one but three times. At the top left we see him hanging on the cross. Around his loins he has a Jewish prayer mantle. The people around the cross are happy. Jesus’ face is peaceful, almost smiling. At his feet we see Abraham with three angels: it is Abraham praying for the deliverance of Sodom. Does Jesus’ death play a role in the deliverance of the world? Three times Jesus is depicted in this window of peace. Jesus speaking about peace, Jesus dying on the cross to bring peace to the world, and Jesus as the Prince of Peace entering Jerusalem. In his paintings Chagall often portrays the crucified Jesus. It is often said that Chagall (always) depicts Jesus as the suffering Jew. 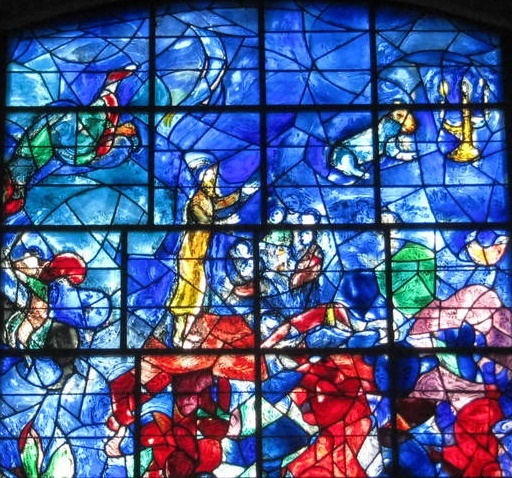 But in his windows Chagall undeniably places other accents on the person of Jesus. 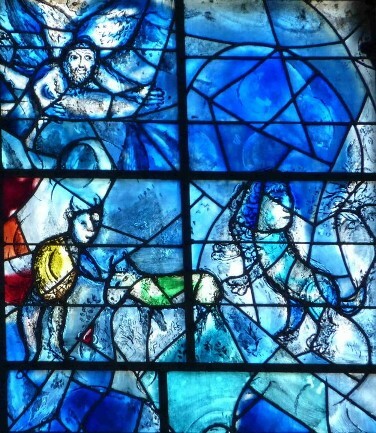 In this window in Sarrebourg Chagall sheds light on more dimensions of Jesus. Even in the crucifixion we see more than a suffering Jew, we see a peaceful Jesus in the context of the prayer of Abraham for the salvation of Sodom. 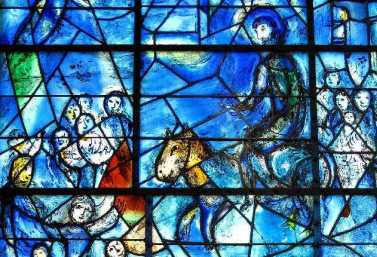 Everyone who carefully studies the windows of Chagall, in Sarrebourg as well as Metz and Zürich (Jesus as the Risen Lord in the central green window), sees that Chagall renders Jesus not just as the suffering Jew. He also portrays him as the Prince of Peace and as the one who (just like Abraham) prays for his people – “Father, forgive them” – and as the one who by his death brings about reconciliation, opening the possiblity of peace with God. And peace with God is the deepest peace of all. 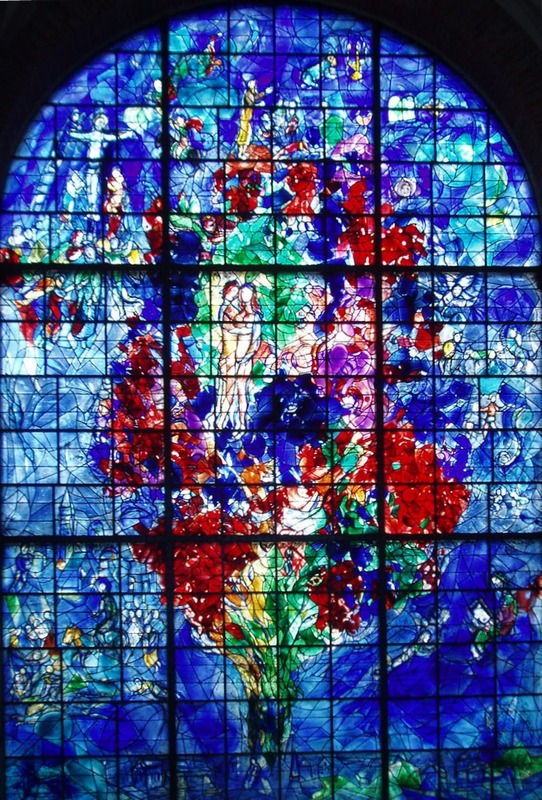 Marc Chagall: Peace Window, 1974, stained-glass in lead, 7.5 x 12 m, 900 kg. Chapelle des Cordeliers, Sarrebourg, France. Marc Chagall (1887-1985) was born in Russia. He was influenced by his early life in the Russian ghetto of Vitebsk and his Jewish background. His style was influenced by cubism, fauvism and surrealism. Hélène Evers is pastor of the Sionskerk in Zwolle, the Netherlands, where she regularly leads Bible & Art services. In 2014 she organized an exhibition with lithographs by Chagall.